After I put my son to bed I often come down to my little home office to get a little more work done before I put myself to bed. Usually I save mindless admin tasks for this time because I have trouble focussing on anything that is deep and meaningful and I can’t do anything that requires research of any sort because then I might end up on youtube watching videos, that don’t do anything to move my mind or life forward. Actually, for the most part not only do they not help me move forward, but it also means the tasks I’m supposed to be doing are going to take a lot longer than I anticipated, which means I’m going to be up later than I anticipated, which means I’m much more likely to snack on something I shouldn’t be snacking on and that’s exactly what happened last Thursday night. I was sitting here at my computer desk doing some work, when I broke out the bag of Salt of the earth bean chips, which I don’t usually have around, but had bought for Saturday night games night. As I sat there working away, I nibbled at the chips and then when I was finally done my work for the night I folded the bag over to put it away when I realized this, I had easily consumed half the bag, maybe more. This enraged me a little bit I mean how could I have let this happen? I didn’t think I was eating them for that long and this was only supposed to be a little snack. I felt a bit guilty, I don’t know if I felt ashamed, but I definitely didn’t feel good about it so I put the bag in the cupboard and went to bed for the night. I know this has probably happened to you, where you’re sitting up kind of late and a little bit distracted, whether it’s watching t.v, reading a book or doing some work and suddenly you get this little hunger pang, where you’re like, you know what, I need to eat something and I don’t think an apple and a handful of nuts or vegetables and hummus are going to cut it. No, I need something sweet or salty or maybe both. Then you shuffle over to the closest cupboard or pantry and despite your best efforts of will, grab that convenient thing you vowed not to eat, at least until the weekend. This has happened to me, probably hundreds of times over the course of my lifetime and I’ve finally noticed a pattern to it, it happens at or slightly after 9pm, every time and here’s my theory, most nights I eat dinner between 5:30 and 6:30, which is good, but 3 to 4 hours later it’s not unreasonable to be hungry again, I mean when I eat breakfast at 5am by the time 9:30am rolls around I’m famished and this is the same amount of time, only it’s at night instead of the morning and it brings me to the only logical conclusion I can have, if I know I’m going to get hungry at night no matter what I eat for dinner then I need to be in bed by 9pm, period. If you’re a late night snacker or grazer, I want you to take note of the time you start to feel hungry again and when you’re most likely to eat a late night snack. If I had to guess it’s probably between 9 and 11 for most people. 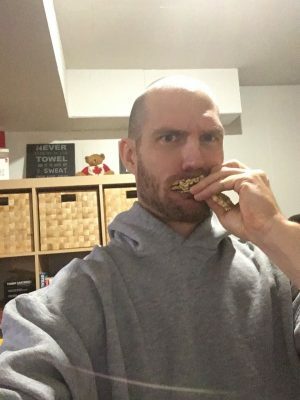 Since we all know that is probably the hardest time of day for you to maintain your willpower, I mean I know it’s the hardest time of day for me to maintain my willpower, maybe a good diet strategy you need is to go to bed 15 to 30 minutes before this late night snack situation happens. Once you’re in bed you might go right to sleep which is the ultimate goal, but even if you don’t and you read for a bit first, you’ll still be be way less likely to get out of bed and grab a snack, the default condition for most humans is ‘lazy’ and this is a scenario where you can actually use lazy to your advantage, by staying in bed and going to sleep. Of course this is a simple concept, but it isn’t easy. I’ve been trying to be in bed by 9 for a couple of years and I have managed to be in bed, between 9 and 9:30 most nights for the last 6 months, but it’s been a struggle and definitely takes a concerted effort, especially when I’m used to working a little bit late and other people in the house prefer to go to bed between 10:30 and 11, but once I set my routine, set an end working time and started building a list of all the important tasks I needed to get done the following day it helped me feel in control and definitely gave me some stress relief, which meant sounder sleep. How much less food would you eat at night if you went to bed a little bit earlier? How much more rested would you feel the next day going to bed earlier? Would you have better willpower and discipline the next day to live healthier, I mean would it be easier to say ‘yes’ and ‘no’ to all the right things you need to say ‘yes’ and ‘no’ to? I want you to think about that and imagine what your life would be like if you took control of your bed time. I know it’s started to change mine and it’s why I think going to bed at 9pm is the best diet you could ever do.